So What's the Weather Like Where You Are Today? Win a Prize! That lovely video below is what I was seeing yesterday morning standing in my garage - as I write this it's gotten even worse. Winter has really arrived in full force where I live in Calgary, Alberta, Canada. Blowing snow, roads being shut down, the whole deal. Since Windows Phone Thoughts and Digital Home Thoughts have a world-wide audience, I'm always interested in knowing what it's like where you live. 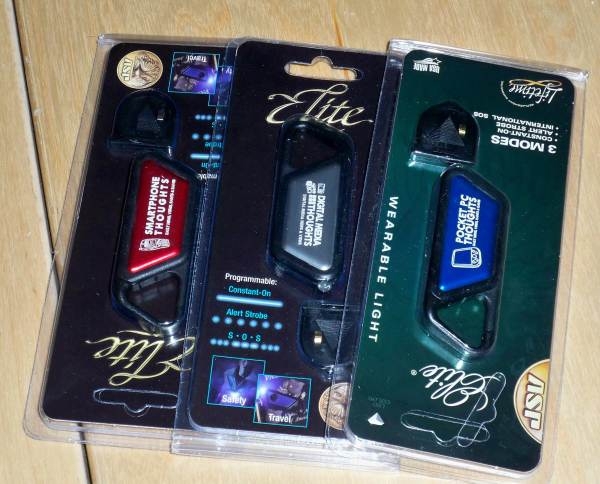 And since I happen to have some now-legacy micro-lights branded with site names that no longer exist (Pocket PC Thoughts, Smartphone Thoughts, and Digital Media Thoughts) I thought there was a way I could clear up some inventory and have some fun at the same time...because who doesn't like cool little flashlights for free? So here's the deal: I want you to post a picture of what the weather is like where you are right now. Bright sunny day? Cold and wet? Night time? It doesn't matter what it is, I want you to share your environment with the rest of the community - it's always fascinating to me to see the different sorts of things we experience. I have 25 Pocket PC Thoughts micro lights to give away, 15 Smartphone Thoughts micro lights, and 10 Digital Media Thoughts micro lights. That's 50 total prizes, and they'll be given to the first 50 people who post an image of the weather or environment they're in right now. BONUS: If someone posts a video, I'll also include a spare battery for the micro light (while supplies last - I have five extra batteries, so first come first serve). So here's what you'll need to do: being among the first 50 people to post a message in our forums as a response to this post, sharing a picture or video. I might just check the EXIF data on the image, so make it legitimate. ;-) If you don't have a Web hosting account or a place to host the image, use a service such as TinyPic or ImageShack (and YouTube for videos). Try to keep the images 800 x 600 or smaller so it doesn't completely break our template. If it's a video, you can post a link to the video if the embedding code won't work (not all embedding code will work in our forums). If you don't know how to embed a photo or video, just post a link to it. After you've posted your picture or video, send me a private forum message giving me your mailing address and which one of the three micro lights you'd prefer. I can't guarantee you'll get the one you requested, so give me a second and third choice. Let's see those pictures and videos! UPDATE: You can't upload pictures directly into our forum, which is why I gave the links to TinyPic and ImageShack. Also, if it's your first post, it will take 24-48 hours for it to appear.